The Italian art cinema of the 1960s is known worldwide for its brilliance and vitality. Yet rarely has this cinema been considered in relation to the profound economic and cultural changes that transformed Italy during the sixties--described as the "economic miracle." Angelo Restivo argues for a completely new understanding of that cinema as a negotiation between a national aesthetic tradition of realism and a nascent postmodern image culture. Restivo studies numerous films of the period, focusing mainly on the works of Pier Paolo Pasolini and Michelangelo Antonioni. He finds that these auteurs' films reworked the neorealist aesthetic developed in the 1940s and 1950s, explored issues brought to the fore by the subsequent consumer boom, and presaged developments central to both critical theory and the visual arts in the 1980s and 1990s. Drawing on the theories of Lacan, Zizek, Benjamin, Foucault, Jameson, and Deleuze, he shines new light on such films as Pasolini's Accattone and Teorema, and Antonioni's Red Desert and Blow-Up. Restivo's model for understanding the relationship of the 1960s Italian art film to its cultural contexts also has implications that extend to the developing national cinemas of countries such as Brazil and Taiwan. 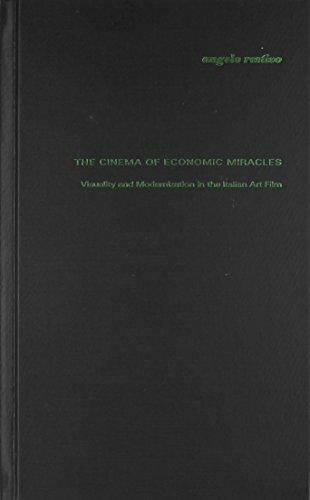 The Cinema of Economic Miracles will interest scholars and students in all areas of film studies, especially those studying theories of the image, national cinema theory, and Italian cinema, and to those engaged in poststructuralist theory, philosophy, and comparative literature.